The Historical Town Walk starts at "Dayboro Cottage" 27 Williams St Dayboro, the home of the Dayboro District Historical Society and the oldest residence in Dayboro still on its original site. 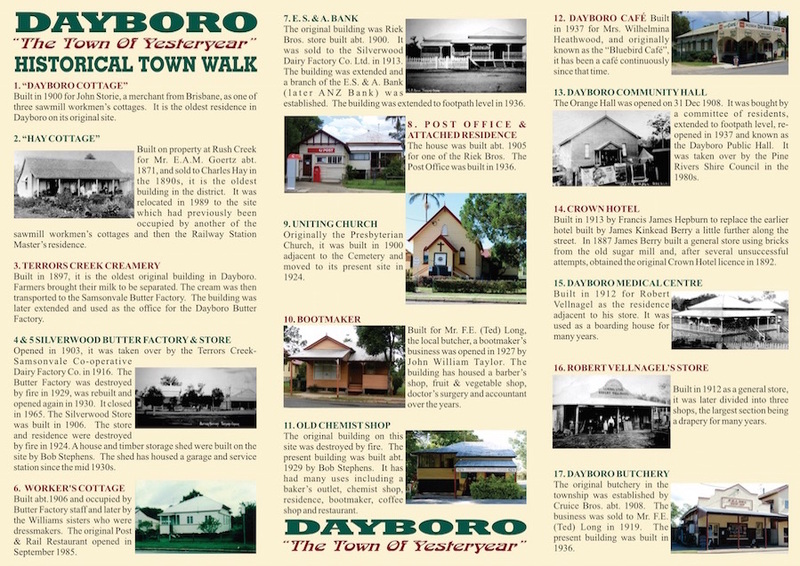 The brochure below can also be obtained from the Information Centre at "Dayboro Cottage". There are 17 buildings listed in the brochure with a short description of each building and a photograph. A numbered map is on the back of the brochure. The oldest building is "Hay Cottage" which was built about 1871 on a farm at Rush Creek and moved to Dayboro in 1989. The other buildings were built between 1897 and 1936 and most of them are still original. Two of them were destroyed by fire and rebuilt. There is also a Brief History of the district in the brochure. The Dayboro Heritage Trail is one of the Moreton Bay Regional Council's self guided walks designed to help visitors get to know the history of the Moreton Bay Region. There are 19 very distinctive orange markers on the trail, each one featuring a photograph and text. The Trail starts at the site of the old Dayboro Railway. 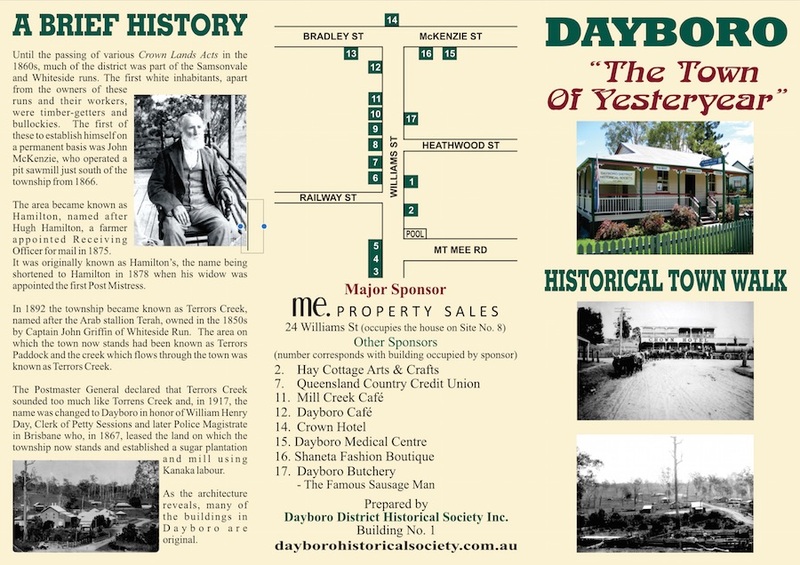 The brochure can be obtained from the Information Centre at "Dayboro Cottage" or downloaded from Moreton Bay Regional Council Heritage Trails or you can just hunt for the markers.